The arch turned out beautiful! 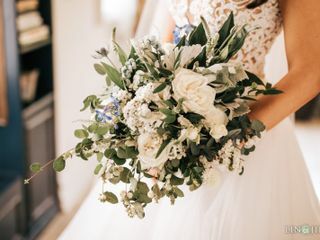 We met with several florists when planning our wedding, and Karen's awesome personality, helpful information and ideas, and competitive pricing led us to booking her and it was by far one of the best decisions throughout the wedding planning process! 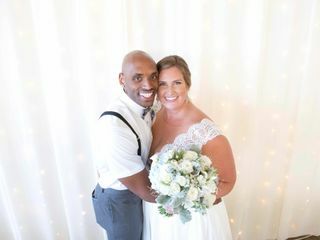 Karen was incredibly responsive to my emails and even connected us with a rental group that had much better prices than our venue for our rentals. She also completely understood my vision for our flowers--I was completely blown away and emotional when I saw them on the day of our wedding! 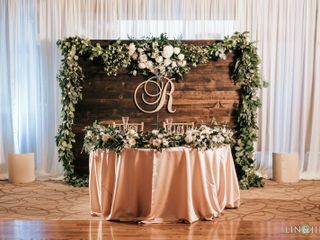 The bouquets, centerpieces and our arch and sweetheart backdrop were more beautiful than I ever imagined and we got compliments all night long. The flowers were also very fresh and lasted for days afterwards. Karen worked tirelessly and her hard work paid off with a stunning wedding. We are so thankful and appreciative that she was a part of our special day and that she helped it to be the most incredible day of our lives. I could not recommend her highly enough!!! Love Karen! She was absolutely amazing in every sense of the word. Karen is so kind and easy going. Our arrangements, center pieces, bouquets, and my flower crown were gorgeous. Would recommend Karen and her assistant over and over. Our wedding day was so beautiful thanks to Karen. She is able to work with any budget and gets the most bang for your buck. Karen is not only a great florist but she is an incredible human being. I am very thankful to have met her and I will continue to work with her for all of my events. A huge thank you to Karen and her team of designers they are all incredible! Karen and her team are AMAZING!!!! Karen did my floral decor for my ceremony and reception, as well as being my Day of Coordinator. From the start she made me feel comfortable. She is so easy to work with, she made my wedding day extra special. She did a wonderful job with the flowers, I sent her a picture of what I wanted and she nailed it. My bouquet and arrangements looked even better than the inspiration pictures. For the arch I basically told her what I liked and she made it look amazing. I wanted simple and elegant and that is exactly what she did. I cannot stop looking at pictures and seeing how wonderful everything turned out. I keep saying was this really my wedding. She is also a great coordinator! I am so glad that I used her for it, I was feeling anxious days before and she calmed me down saying everything will look great. We had a few issues with the Mariachi and she handled it great. Everyone keeps raving how on top of things they were, they made sure I ate and had something to drink before the ceremony and during the reception. Her assistant that day was Chelsea, everyone loved her as well. She was so helpful with anything and everything we needed. My 2 year old niece/flower girl fell asleep before the grand entrance and Chelsea was carrying her, this is how amazing they are. I can't recommend her enough, she is amazing!!! Thank you sooooo much Karen and team!!! Karen was both our florist and day-of-coordinator. She did an amazing job on the flowers. She provided a lot of great tips and advice for the decoration, which was beautiful! The wedding day also went very smoothly for us. Everything was executed perfectly with even some time to spare. We're very thankful for Karen and her team! Karen was so patient and kind. She was able to recreate my floral choices from photos I had seen on Pinterest , and they came out more beautiful than I imagined. She provided our wedding party bouquets, my bridal bouquets , arch design , Boutinerres and pew decorations. I would highly recommend Karen for your floral services! Besutiful arrangements. Super friendly and flexible. We are luck to choose Karen as our wedding florist. She is professional and easy to communicate. We arranged a short meeting with Karen and described what we want for our wedding. Karen did the remain work and prepared the beautiful flowers for our ceremony and reception. Thanks Karen, great job! Karen is the best! She is knowledgeable, flexible, professional, and wildly creative. I was extremely impressed with how Karen transformed our venue into a wonderland. 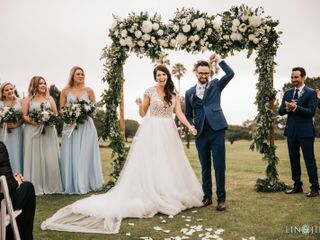 She has a ton of connections in the industry and will work tirelessly to insure that your wedding is everything you want it to be! 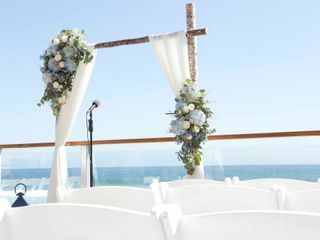 She was indepedespeble in making our wedding a beautiful and unforgettable experience! We love Karen! 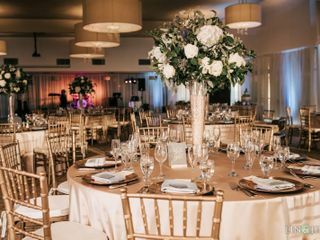 We brought to her our color choices and theme (Disney) and she helped us execute the most gorgeous and unique centerpieces. All of her flowers and creations were unbelievable, and she was the nicest to work with. Our ceremony and reception looked amazing and it's all thanks to her! Karen was above and beyond amazing!!! I told her what my vision was in the best way I could, not actually knowing anything about flowers, and she was able to make it come to life better than I could have even imagined! I was so impressed by the personal touch she brought to her work and the interactions I had with her. It never felt like she was just a vendor I was paying to put flowers at my wedding, it felt like she was family who was truly invested in helping make our wedding the most special day of our lives. I am forever grateful to her and would recommend her to anyone! Karen was wonderful to work with, and helped us every step of the way. She truly transformed our venue, coordinated all the details, and provided excellent vendor referrals. Karen is extremely professional, organized, and takes the time to understand her clients style and preferences. Working with Karen was a wonderful experience! I don't know flowers and was unsure of what I wanted for my wedding besides "pretty colorful flowers". She was patient and knowledgeable and recommended beautiful blooms that fit my budget. 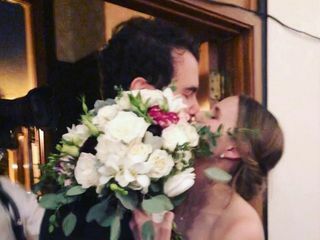 I could not have been more pleased with the flowers that were used for my big day and the arrangements themselves were stunning! Karen was really great. She worked with us on pricing and did an incredible job matching our colors. Overall, she was truly a joy to work with. 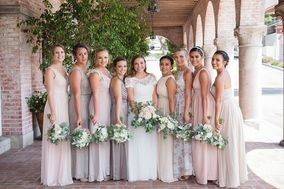 Karen was the most amazing floral designer a bride and groom could ever ask for! She was fantastic to work with and made my special day even more beautiful than I could imagine. Karen design my bouquet just like I had dream. My bridesmaid bouquets looks amazing as well. The decoration on the gazebo was outstanding! Karen was able to work with our budget as well! She has so many creative ideas and insights and tons of experience with brides. I would highly recommend her services to our family and friends! Karen went above and beyond our wildest dreams. She paid attention to every detail including some that we had forgotten. She helped make our day very special and we will recommending her to everyone we know. Karen was absolutely amazing. She made our wedding day extra special with all her beautiful flowers, she did a great job. Thank you so much. I will definitely tell my friends and family to use her on their special day. I was very lucky to have Karen as my floral designer for my wedding. She was fantastic to work with..... she listened to my ideas and thoughts and built on that to provide wonderful suggestions and options to consider. She has a wealth of experience in making events even more spectacular. She gave me exactly what I wanted for my wedding and more. She is also a very sweet, thoughtful, and kind person with an excellent work ethic. I was very happy with how she designed everything on my special day.